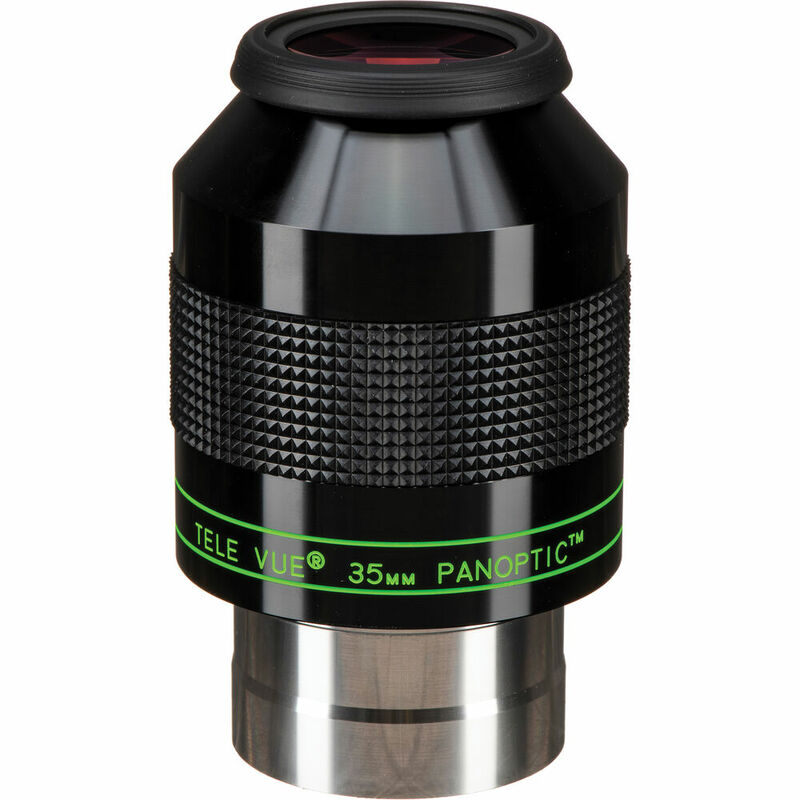 Taking performance inspiration from the venerable Nagler series, then combining the optical design properties of both an eyepiece and Barlow, the Tele Vue Panoptic 35mm Wide Angle Eyepiece has a 6-element/4-group lens configuration that produces a generous 68° field of view and improved edge-of-field performance, while minimizing size and weight. This eyepiece has a long 35mm focal length that produces a relatively low magnification on most OTAs, making it ideal for wide-field observations of the night sky and most lunar, planetary, and deep-space objects. It is outfitted with fully multi-coated optics to maximize light transmission, color rendition, and contrast, with blackened lens elements that limit internal light loss and diffraction; and a fold-down rubber eyecup that helps to block stray peripheral light from interfering with the views and to further enhance contrast. Its exceptional 24mm eye relief provides ample room between the lens and eye to prevent accidental contact that can interfere with views. This model has a large 2" barrel diameter to make it even more comfortable to view through, and a textured rubberized grip for sure handling. Box Dimensions (LxWxH) 6.8 x 3.6 x 3.25"
Panoptic 35mm Wide Angle Eyepiece (2") is rated 5.0 out of 5 by 1. Rated 5 out of 5 by dan s. from Like all other Tele Vue eyepieces I use this eyepiece with my Vixen VC200L as a wide-field piece (1.23 degrees TFoV) and my Vixen AX103S (2.69 degrees TFoV). Like all my other Tele Vues it just works, well-built with clear, crisp images. It is relatively large and heavy, but that comes with the territory and the performance.